There are few sights more beautiful than a tall ship moored in Whitby harbour. 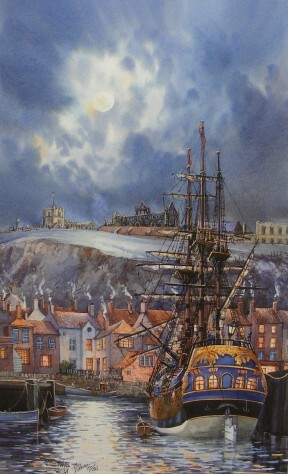 Make that ship HM Barque Endeavour, berth her opposite Captain Cook’s house, drift silvery clouds across a full moon, add shimmering reflections and the end result is this work by John Freeman. The painting was created from details gathered during the visits of the Australian built replica of HM Endeavour. Sadly, the ship is now permanently based in Australia. Since 1969 the scene around Whitby harbour has inspired John Freeman’s work. His moonlit studies or Nocturnes are much admired and this one captures this atmospheric view to great effect. Signed limited edition Giclee` print. Image size approx 13" x 21"